Strong storms bring about the worst conditions – not just in weather, but in your surroundings, as well. Besides the sights and sounds of thunder and lightning, the heavy downpour and strong winds are your worst enemies, as well. Items that are not securely kept from the elements can be carried by the storm and come crashing into your property. When this happens, clutter will not only be your problem, because structural damage, such as broken windows, busted doors, and cracked walls, can occur. With your home exposed, it is likely that rain water will enter your living spaces – causing it to flood indoors. After the storm has passed, you are left with a soggy and wrecked abode and heavily drenched belongings. It is clear that dealing with the event via DIY or manual methods will not give you justice. Without the proper tools and gears, even the simplest acts can get you injured. Various objects such as wood, loose nails, and shards of glass, can be lying in the area stepping on one can send you to the hospital. Also, without the correct step-by-step restoration process, the end product might not be to your liking. The best possible solution you have to get through this rough time is to consult the help of the professionals. 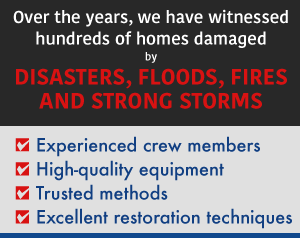 Wrecks that were caused by storms are not your everyday water damage restoration jobs. Since we are dealing with something in a much larger scale, bringing the life back to your properties must be done with extra care and precision. There are a lot of hazardous situations that can happen during the restoration process, and that is why it is better that we, at Best Cleaning and Disaster Restoration Services, handle the case. With our team of professionals on the job, it is certain that your homes will return to durable form in no time. Once we have received a project, we will first inspect the damage we are dealing with, and estimate the price on-site for FREE! After that, we will proceed to the restoration proper. If your area has bit heavily hit by flooding, we will drain out the water using our specialized equipment. Scattered debris and useless items will be immediately removed so that it will be easier for us to further assess and work on your property. After we have gathered enough information, we will begin repairing and restoring the damaged areas. We never leave a property half-done, and make it a point that our clients are happy with the end result. Through this final inspection, we will know if we have missed something important, and to check if your homes are completely safe and secured. You can contact Best Cleaning and Disaster Restoration Services by dialing: 970-235-9151. You may also visit our contact page here for further questions and inquiries. 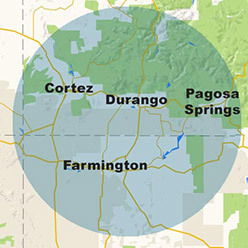 All of our services are availabe to properties located in the Four Corners Region (in Cortez, Durango, Farmington and Pagosa Springs).